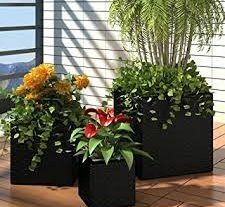 The trash can at home, especially in the bathroom, has no lid to easily emit an unpleasant smell, and it is easy to cause bacteria to grow; if there is a lid, it is too troublesome to open it every time. The automatic sensing design of the trash can automatically open when the person or object is close to the trash can sensing area. When you need to open the cover frequently, you can also fix it with one click. It is very user-friendly. Editor introduces several smart trash cans here. Yizi intelligent sensor trash can YZ-GB203, automatic opening in 0.3 seconds, automatic closing in 5 seconds, the bevel can also be sensed. The inner barrel is convenient to propose, the outer barrel is convenient to move, and the washing is convenient. This smart trash can is a new design, smart chip. Bucket cover buffer shaft, intelligent slowdown, quieter at night. Stainless steel, brushed stainless steel. The barrel is smooth, waterproof and rustproof, stylish and refined. Ou Ben automatic sensor trash can, 0.3 seconds automatic sensor open cover, the body close to the sensing area to open the lid automatically, automatically closes about 5 seconds after leaving. The lid of the bucket is formed by one-time lamination, and the sealing performance is excellent, which effectively prevents the odor in the barrel from spreading. The lid of the lid switch adopts buffer technology, and the lid of the switch is only 40 decibels. This smart trash can uses a one-button lock to open the lid, eat snacks, throw fruit chips and no longer need to get up, a button to open the lid to make life more comfortable. 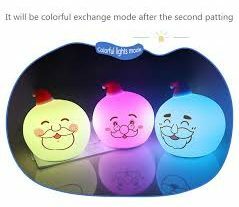 Equipped with a new upgraded smart chip, the performance is better, the sensitivity is higher, the response speed is faster, the stability is stronger, the energy is smarter, and the power is saved. Nashida Intelligent Sensor Trash Can 12-5S adopts intelligent infrared sensor. When someone or something is close, the sensor area is opened for 0.3 seconds, no need to touch, convenient and hygienic. When the garbage is frequently processed, simply press the OPEN button to protect the open state. Press the button again to close the lid. This smart trash can adopts waterproof and moisture-proof closed design and closed switch design to prevent environmental problems caused by domestic garbage, create a comfortable space, effectively isolate the residual odor in the barrel and fully protect the health of the family. The good helper intelligent sensor trash can JBSGYT89C40 adopts one-button reset technology, the lock mode in any state, just press the CLOSE button, it can automatically return to the automatic sensing mode. This smart trash can has not only a battery compartment, but also a large-capacity lithium battery. Made of high quality PVC new material, no odor, good toughness and aging resistance. The buckle design makes life more colorful, even if there is no electricity, it can still be used. EKO smart sensor trash can 9229 adopts a new waterproof head design, and it can still move as usual in the face of the wet corner of the bathroom. The small hidden design of the drain hole at the bottom of the machine head can collect the water droplets inadvertently infiltrated by the barrel head and uniformly drain into the inner barrel, so that the intelligent system can be effectively protected from moisture. When the lid is opened and closed, the smart chip will control the lid to slow down and slow down, further improving the mute effect. The cushion acts as the last step of noise reduction, and the art of quietness from the audiovisual sense. Happy Cat Automatic Induction Smart Trash TG08 adopts infrared sensing technology, which responds quickly in 0.3 seconds. It does not delay the reaction quickly and accurately. It can realize automatic opening and closing of the lid without touching the trash can. It is easy to use and clean. This smart trash can uses sensor on and mobile phone to open, and the two options are easy to control. When the garbage is processed frequently, simply press the OPEN button and the lid will be permanently protected. 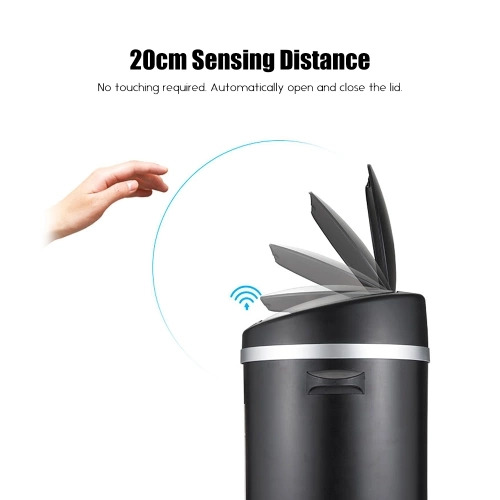 Intelligent sensor trash can Comix L211 uses 20CM sensing distance, no need for human contact, the gesture is up, open and open. OPEN button, the lid automatically opens, and the frame is permanently fixed. CLOSE button to close the lid. This smart trash can has a beautiful black coat and is also waterproof, rust-proof and anti-fingerprint. PP plastic inner barrel storage, fully sealed design, no odor. 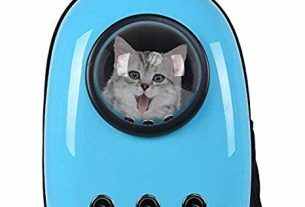 Do you want your pet to travel with you?